"Excellent control pack for some of the lacking functionality which comes with some VS.NET 2010 controls. Excellent IP Address control for easier work with IP segments, as well as a much more robust DateTimePicker control with support for the so long needed TAB key option to switch through the various segments of the date/time. Also much easier to support NULL values rather than relying on a checkbox! Also works great with partial dates such as expiration dates which only require mm/yyyy format, etc. Support has been A++ and suggestions are taken into consideration and implemented very quickly if decidedly a good one! Would certainly recommend this control pack for any .NET developer who finds the DateTime control and MaskedTextBox insufficient for themselves or their customers!" I’m happy to unveil the new VisualHint identity. It is based on the old logo but now features a brand new look that I find far more attractive, dynamic and professional. It precedes the conception of a new web site that will bring together the existing library for MFC and the new one for .Net. I downloaded a copy of the express edition yesterday and I am happy that the Smart PropertyGrid library compiles well. First tests show no crashes also. I encourage you to continue your beta testing under the official release. The Microsoft PropertyGrid doesn’t use the DateTimePicker control to edit a date. It uses a simple dropped down month calendar and therefore it is not even possible to edit a time only. This was the indication of a challenge for me. There was several difficulties. The first one was to show the proper BackColor. Once done, I discovered that when made initially visible, there was a nasty flickering effect. So I had to fix that to get the same quality standard as all the other inplace controls. I did it but the fix was producing erratic drawing when clicking on the fieds of the control or using the arrow keys to change the values. Well, now this is done and I am pretty proud of it. You can see it in action in the new build 11 and the updated sample application. The Microsoft PropertyGrid has a built-in mechanism to handle default values: it displays them by using a non-bold font while the other properties are painted with the bold style. The Visual Studio designer also proposes a menu to reset a property to its default value. I could have done the same in SPG but this would not be very flexible. Some people, like I did in a C++ application recently, will want for example to display a very subtle different background for non default values. Or maybe you simply want no difference at all. That's why I provide no built-in mechanism at all !! I have published today a sample application. In fact this is my test program that showcases almost every feature of the PropertyGrid. At the same time, I have updated the SmartPropertyGrid assembly to build 2 since a dozen of bugs have been fixed. It will be demonstrated in the first demo to come. So, what else can you do with that ? Your imagination is the limit here, but let's see another example. 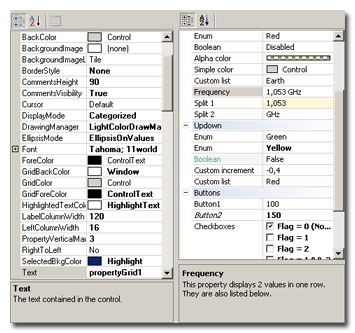 The font dialog is able to let the user choose a color for a font. But the font doesn't store the color. That's why the Microsoft PropertyGrid doesn't manage colors for fonts. SPG can allow you to store in one row a reference to a font and to a color. By writing the right Look class, it can be displayed the way you want (a color box followed by the font text or a colored font text, ...), and it will be edited by a font dialog that enables color selection. Of course this is not limited to two variables. If you have some built-in arrangements of multiple variables that you would like to see developed in the package, just tell me. I’m still here and very active. Because several people asked me the status of the library by mail, here are the very uninteresting reasons of my silence: first some family came here then I took some vacations and very recently I had a major computer crash with data loss. I only got it back from repair some days ago. When everything is restored, I will finalize the evaluation of an obfuscator. Concerning these two articles, I would like to thank their authors because they helped me, among other sources of documentation, to understand the inner workings of this complex windows forms control. And I'm pretty sure that if I read them again, I will find a small detail that I missed. Sorry not to have posted during several days. Things continue to progress though. The main thing is that I have frozen the development because I am now working heavily on the documentation for the API. NDOC does not fully recognize C# 2.0 but nevertheless I can work with it and preview my progress. Once I am satisfied with it, I will publish an alpha release so that you can play with the PropertyGrid. From the discussion that will result, I will continue the development and create a beta program. In the meatime, please continue to give me your thoughts and expectations.